This warming and comforting jjigae (Korean stew) is made with extra soft tofu (soondubu), thinly sliced meat, kimchi and anchovy broth. It really takes less than 30 minutes to prepare this flavor packed Korean tofu stew! 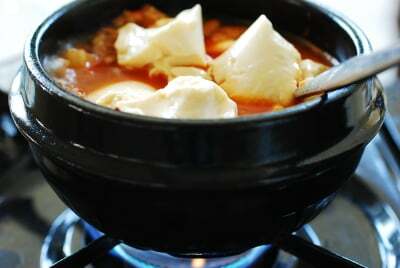 Today, I’m posting another soondubu jjigae (순두부 찌개), Korean soft tofu stew. This time, it’s made with soondubu (also spelled sundubu, aka silken tofu), ripe kimchi and thinly sliced meat. 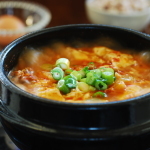 Do you have a Korean tofu house near you that specializes in soondubu jjigae? Restaurants usually offer several variations (seafood, meat, vegetables, combination, etc.) on the menu. Which is your favorite variation? 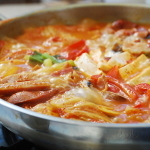 This kimchi soondubu jjigae is very popular. Try making it at home. 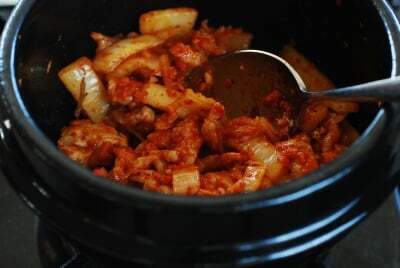 For the best results, always use fully fermented kimchi to cook with. If you have some salted shrimp (saewujeot, 새우젓) leftover from making kimchi, use a little to season the stew instead of using salt. It adds a nice layer to the flavor of the soft tofu stew. I like to use anchovy broth as a stew base, which is typical, but you can use any other broth or water. This recipe combines kimchi and pork, a classic match. Feel free to use beef, chicken, or seafood and switch out the pork. Mushrooms are a good substitute if you don’t like meat. If you start with vegan kimchi, you can even make the stew vegan. 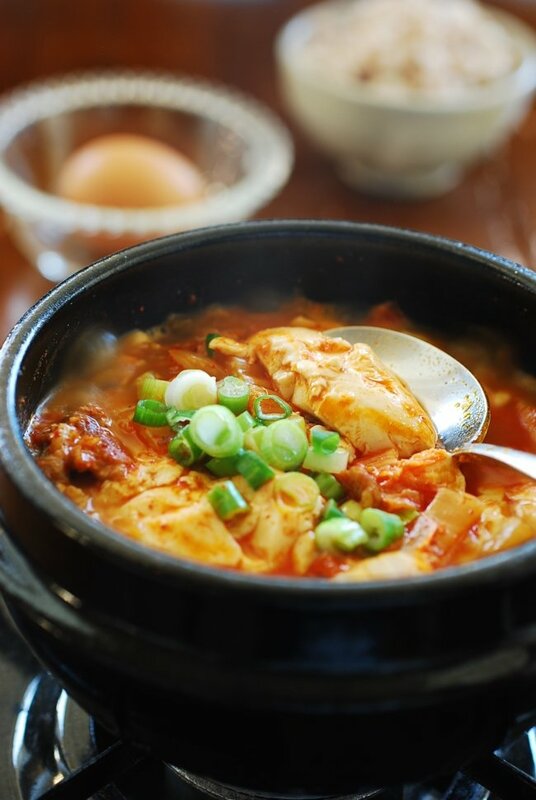 Soondubu jjigae is often served with a raw egg to be cracked in to the boiling hot stew at the table. The egg adds richness to the stew, but you don’t need to add an egg if you don’t want to. It’s a matter of preference. I always keep a package or two of soondubu in the fridge, and whip up this bubbling pot of flavorful jjigae when I need to create something warm and comforting quickly. 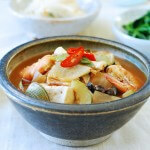 Have you tried this Korean tofu stew recipe? Please rate the recipe below by either clicking the stars or with a comment! And make sure to share your creations by tagging me on Instagram! I’ll also be very happy to see you on Pinterest, Twitter, Facebook, and Instagram. 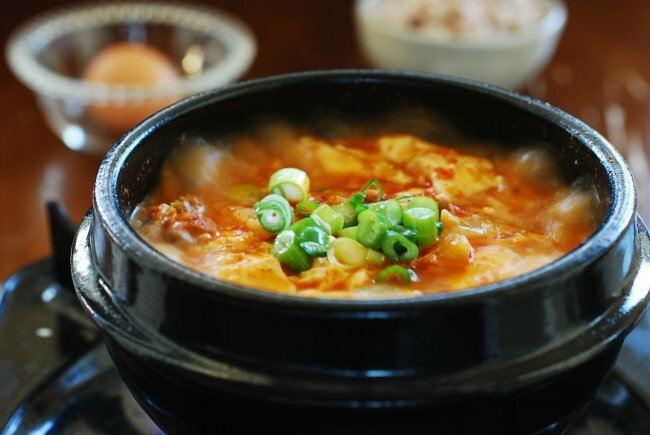 This warming and comforting soondubu jjigae is made with extra soft tofu, soondubu, thinly sliced meat, kimchi and anchovy broth. It takes less than 30 minutes to prepare this bubbling pot of stew packed with robust flavors! Cut the meat and kimchi into small thin strips. 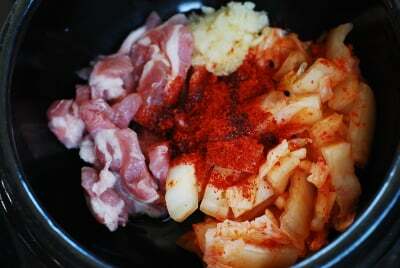 Add the kimchi, meat, red chili pepper flakes, garlic and sesame oil to a small pot, and place it over medium heat. Stir-fry until the meat is almost cooked, 3 - 4 minutes. Pour in water (or broth) and the juice from the kimchi. Bring it to a boil, and continue to boil for 3 - 4 minutes. Skim off the scum. Add the soft tofu in big chunks. Stir in the salted shrimp or salt to taste (start with 1/4 teaspoon) and black pepper. Cook for 4 -5 minutes. Add the chopped scallion just before removing the pot from the heat. If desired, crack an egg into the stew to serve while it’s still boiling hot. I am surprised that no one has commented yet…..Thank you so much for this great recipe. It was easy to make and so tasty. Made it twice within a week. Definitely approved by hubby. Thanks again. Thank you, Jennifer! That’s great to hear. It means a lot to me that you took the time to let me know how the recipe worked for you. Hope there will be many more to follow you. Cheers! I would like to make a version with mushroom in place of the meat like you suggested. But what type of mushroom is best? I rehydrated some dried shiitake mushrooms and it turned out delicious. Thanks for the recipe, so good! I love the photos. I wanted to eat this today, and I made it instead of going to a restaurant like usual and it is GREAT!!!!!!!!!!!!!!!!!! awesome! I’m proud of you! Can I use Gochujang instead of Gochugaru? Would it affect the test of the jiggae? Yes it will. Gochujang is salty and sweet whereas gochugaru is just spicy. A little bit of gochujang is okay, but too much will make soup thick, salty and slightly sweet. I wanted this today and found your recipe. I modified the recipe, leaving out the meat and using organic tempeh. it turned out fabulously. Big hit in my house!!! That’s great to hear! 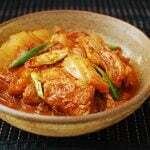 Hope you find many other recipes your family love on my blog. Thank you! I have loved soon dubu ever since I had it living in Seoul. This recipe was perfect and not intimidating, like some Korean food recipes. You’re welcome! I’m glad to hear it was perfect! Thank you so much for this. I went to Koreatown in my area just to have it and now I can make it at home. 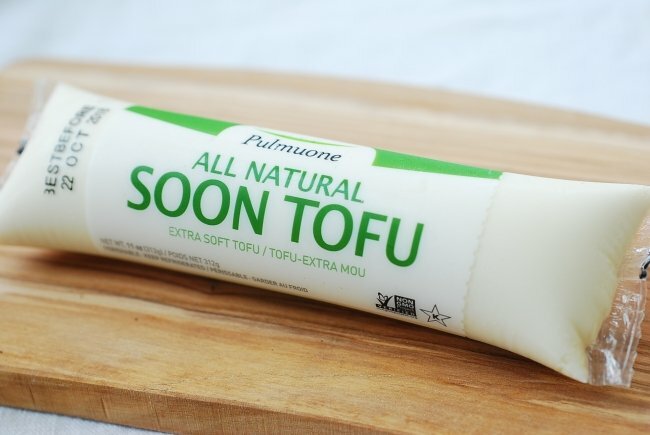 I used firm tofu instead, I thought I bought soft tofu. Will the firm tofu effect the taste? For this stew, it’s actually extra soft tofu (aka silken tofu). It’s a little different concept because this is to be made with silky soft tofu, but I am sure it’s still delicious. Thank you so much for this recipe. I will surprise my wife with this when she gets home. Thank you for clear and easy to understand korean recipes. I can now make proper korean dishes without guss work! Soondubu stew is my very favorite dish. Thank you so much! You’re welcome, Haysook! I’m so happy to be helpful. I’ve tried some of your recipes. They turned out very good! Love your blog! Thank you! Thanks for the recipe; this is one of my absolute favourite Korean dishes and I can’t get it here in the UK. I will definitely be trying out your recipe; I just hope I can get hold of the ingredients. I loved your bibimbap recipe too and hope you don’t mind that I posted a link to it on my vegetarian food blog! I will be honest, I am not a good cook,but I nailed it, just by following the recipe! I added some clams to it. Thank you so much for sharing this wonderful recipe. That’s awesome! You are welcome. You can be a good cook. Keep on cooking! ANNYEOUNGHASEYO! I am grateful for this recipe! However, I am sad to say I am allergic to Sesame Oil and Sesame Seeds. What can I use instead? Just use regular cooking oil. Enjoy! Thank you for generously sharing your recipes with us all, Hyosun. You are such an angel. You’re welcome, Janice! I am happy to be helpful. Hope you and your family enjoyed pork belly. Could I kindly enquire whether you have the receipe for Korean steamed egg? If so, would be really appreciative and greatful if you could kindly share it with us. Thank you Hyosun, for your kind reply. Thank you, Catherine! I will. I just noticed that whenever I made this (and that’s about five times by now) I measured the gochugaru using tablespoons instead of teaspoons… they turn out spicy (and awesome!) enough for my family’s tastes, but does it alter the flavor so much that it becomes less authentic? Thank you! Wow I am sure it was spicy! Glad to hear your family still enjoyed it. No, it doesn’t alter the flavor other than the spiciness overpowering the soup. Thank you so much for posting these delish looking recipes, I just found your page, but I’m so looking forward to trying each one of them, thank you. Thank you so much for this recipe. It’s just like when I lived in Guri. There was a galbi restaurant in the market and this takes me back there. I used portobello mushroom slices and some thinly sliced yellow squash and zucchini. Wonderful!! 감사합니다!! I want to report that this recipe is low carb/sugar diet friendly. 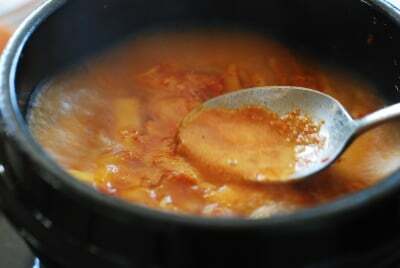 Many Soup recipes like this use Gochujang, which is high in carbs and Corn Syrup. Also, a good substitute for the anchovy broth is Dashi. A Japanese fish broth. You can get bouillon type granules for it in the Asian markets and some non-Asian markets. Its much easier than making it from scratch and tastes good in recipes. I have it on hand for Miso Soup. Also, you can get anchovy paste. Choose a good one, they can vary in quality. Just squirt some in with water in the soup, taste and adjust as needed! Thank you for a great recipe; is this a family recipe? I mean its that good. When I was living in Korea, I had food like this from the homes and people who treated me to all the wonderful cuisine of the country. This recipe brought me back. I didn’t realize how easy this recipes is. I didn’t have gochugaru so I use regular red pepper flake instead and it still make out Delicious! Thank you! Hi Samantha – Aww that just made my day! Thank you so much for taking the time to write me such nice words. It means a lot to me. hi! i really enjoyed this recipe and plan on making it soon once i have all the ingredients. i have a question though – once made, can this recipe be frozen? i am unsure due to the addition of tofu. Hi Rie! Glad to hear you enjoyed the recipe. Freezing tofu will alter the texture badly, so I wouldn’t recommend it. Hi! 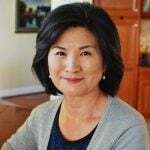 I so appreciate your easy to follow recipes — I don’t live near family nor are there any good Korean restaurants in my area so my husband and kids rely heavily on me to provide Korean food for them! 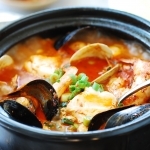 Or, use my haemul soondubu recipe if they like seafood and simply omit/reduce gochugaru. 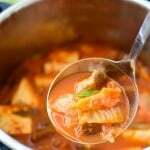 The seafiod will give the jjigae a nice flavor. Hi! Thank you for sharing this recipe! I tried it and unfortunately it didn’t turn out as flavorful as I would hope. I’m wondering where I went wrong. I followed the recipe but since I didn’t have gochugaru I used the red chili flakes from a Costco packet and did 2/3’s cup of thinly sliced kimchi instead. I also used water instead of anchovy broth. Does that anchovy broth make a huge difference? It smelled delicious when I was cooking the meat but then after a certain point (especially after adding the water it didn’t smell as great). First of all, that’s a lot of kimchi for one package of soondubu. The tofu should be the star of the dish, not kimchi. The combination of gochugaru and sesame oil, stir-fried with fatty pork, is an important step for flavors. When gochugaru is cooked in oil, it creates a chili infused oil flavor, which is delicious. Was kimchi ripe? Another important point. 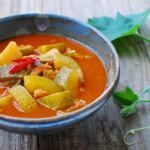 Anchovy broth makes a noticeable difference for the depth of flavor, but if all the other ingredients are used, the stew is still delicious without anchovy broth. I make this stew with water sometimes. Hope this helps. Delicious! Delicious! Soondubu my favorite! Thank you for sharing. Do you have a recipes for O’jingopokum? Another favorite. I love this soup, sometimes I make this 2 to 3x a week. i always crave this whenever it starts to get really cold, I’m excited to try this recipe in particular! thank you! Yes it’s especially good on cold days. Enjoy! Hello! 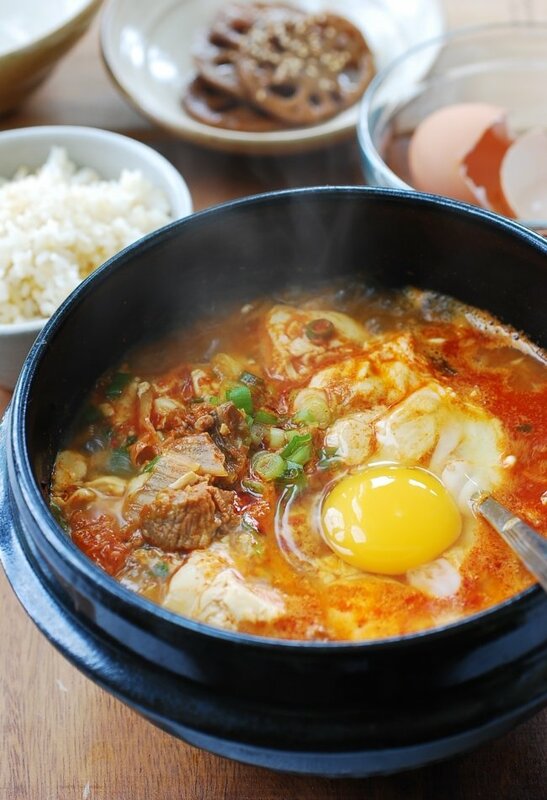 I am going to make this recipe in the next few days and I have a question: does the raw egg get stirred into the stew at the end so that it blends into the broth? Or do I end up with a cooked egg on top? The recipe says it’s for two people, so I want to know whether I need to add a second egg ( if it remains whole on top). Thank you! 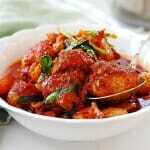 Yes it blends into the stew, making the stew a bit richer and adding another layer of flavor. But, it’s optional. This is two small servings. I wouldn’t add 2 eggs. Hope this helps! Thank you for clarifying that the egg should be mixed into the stew. I ended up doubling the recipe so we’d have leftovers (but did not add two eggs). It was so good, and so easy! We call it ddukbaegi. It’s an earthenware. You can find them on line by searching Korean earthenware pot. I made this for dinner this evening and it was yummy! So easy and delicious! I used oyster and enoki mushrooms instead of beef, and used dashi broth+fish sauce for the broth- worked great! Also doubled the broth amount for extra liquid… had it two nights in a row and can’t wait to have it again. Thanks for posting this easy recipe!! Hi! So glad i came across your recipe as i’ve been craving soon tofu for weeks! Looking forward to trying this on the weekend. May I ask, what’s the best pork cut to use for this? Thanks! I like it with some fat, but you can use any cut, depending on the fat level you want. 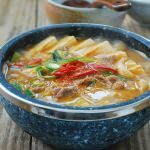 I’ve made this jjigae so many times, it’s delicious and I find myself craving it lately!! I always leave out the meat to make it vegetarian, but I don’t think the flavor suffers at all. Thank you for the great & really easy recipe!